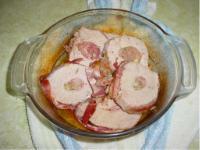 Pork Loin is a challenge to cook mostly because it is a dense meat (little or no fat content). Additionally the shape presents a challenge in getting seasonings to the center. I did some research and found many methods of cooking from butter-flying to slicing into a roll to stuffing as a thick chop. And in that research I read about sausage stuffing the center! Hmmmm... that one got my attention so I looked some more and then took what I learned and added my twist. Here's what I came up with. As stated earlier the loin is a dense meat, so I figure, "introduce some fat" right? Bacon fit the bill here (Hey it's pig too!). The sausage I used was some store-bought homemade that I had in the freezer. I just cut a chunk off, defrosted it and pulled it out the casing . 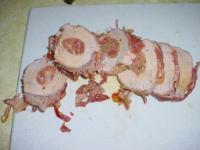 The loin was cut in half and the remainder went in the freezer (for future experimentation). I was only feeding four people here. To begin I sliced a nice sized (1-1/4") slit in the middle of the loin lengthways. This is coming from the cut end sort of like making a tunnel. I cut almost to the end so I wouldn't loose any extra juices. So now I have the loin with a hole only on one end. I seasoned it with savory seasonings (your choice), in the cavity and outside, and olive oil and let it set in the ice box for about an hour. You could probably get away without marinating it at all because the meat is so dense not much is actually absorbed. Pre heat the oven to 350ºF. 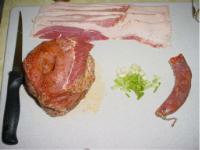 Take the loin and stuff a slice of bacon in it. I added a little green onion, garlic and a big pinch of brown sugar. Mix all of this around with your finger. Stuff the sausage in it and move it around inside good again. Finish the stuffing off with another piece of bacon. 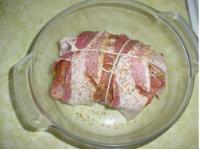 Drape bacon over it and tie it with cooking twine. Put the loin in a baking casserole or pan and cover it. (You can also do this on the pit in foil) Add about 1/4th cup of water. Bake at 350 for about two hours. Use a meat thermometer to check for doneness (170ºF). At the finale (1 hour - 45 minutes) take the cover off and let it go another 15 minutes. Take it out the oven, baste it and let it stand for about 15 minutes. Cut the strings and slice it in 1/2 inch pieces. Put it back in the casserole and drizzle the fat juices over it a few times. Yams and butter-garlic pasta accompanied this main course. It was tender enough to cut with your fork too! If you choose to do this on the pit allow at least 3 hours to cook. 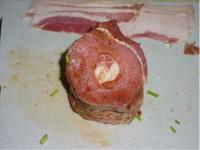 You can enclose the loin in heavy duty foil adding a little water to it so it can steam.